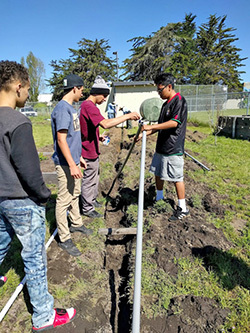 On March 31 2018 the Central Coast CLCA Chapter contributed their design skills and labor to the Natural Bridges High School, helping them to realize their goal of capturing and using rooftop water to irrigate their fruit trees and gardens. Sherry Bryan of Ecology Action helped to redesign an existing water catchment system so the water could be used to irrigate trees and plants at the site. 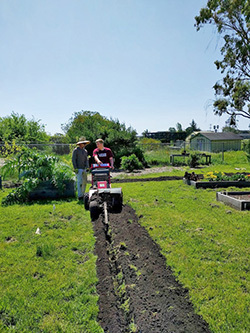 In addition, CLCA designed and installed an automatic drip system in the raised beds where the students propagate and grow herbs and vegetables. Many thanks to Aqua Green Touch Landscape, Coastal Evergreen Company, K & D Landscape and Pacific Mountain Horticulture for the donation of their labor and materials to complete this task. In addition, special thanks go to Steve Veltri and Hunter Industries, Craig Stenehjem and SiteOne Products, and Matt Gomez and Ewing Irrigation for their generous donation of materials to the project.